Did you notice there is nowhere to enter your name or other details in the purchase page? How do I get my tickets once I pay? These are probably the two most asked questions before purchasing tickets on our website. Ready for the answer??? Where do I enter my personal information? After you buy your tickets, you will receive an email from us confirming the payment and requesting you to reply to our email with two important pieces of information. The FULL LEGAL name (In English) of each guest attending and their country of citizenship. This information will be registered to the seat/ticket and will be used if any confirmation is necessary at the event. Please note: We DO NOT need your passport number or any other information. Will I receive a ticket? You will receive a printable ticket later in the year. It will have the legal name printed on the ticket. This name will also be registered on our registration system and will be checked when you arrive. Please remember to bring legal identification (Passport) that has the same name as listed on the ticket. Because we are a small family business that manually processes EVERY ticket purchase. It is a lot more work, but we can better control the process and provide a better, personalized service. You will notice that some of our emails are “form” letters, but the replies to any of you questions or requests are all personal replies. Send us a message with any questions about the Festival or Chiang Mai in general. We are happy to help! Where is the best place to ask questions or for advice? Yee Peng Doi Saket – VIP IS SOLD OUT!!! Section B and Section C are still available for purchase from the website. Buy them while they are still available. We CAN NOT hold tickets without payment. Well, we hope its just a delay…. Yee Peng Lanna International 2018 has not yet been able to get a meeting to ask for approval to proceed this year. We hope to complete the process in August/September 2018. If it is approved, we will sell tickets immediately. We have reserved additional tickets to the Doi Saket event for those who do not want to take a chance waiting for Yee Peng Lanna International to get approved. YPLI has been approve and has already SOLD OUT! Wait, there are two different events? Whats the difference? Well, over the years there have been at least 5 events in the area. The original one (free event/ local event) was cancelled about 4 years ago. The reasons given ranged from too much commotion in the area/problems arising from 10,000+ people in one area, to financial issues (it was free), to various political issues. In any case, it is long gone and will not happen again. The same group that ran the free/local event now run the Yee Peng Lanna International (YPLI/Mae Jo). It is the oldest paid event, going into its 6th year in 2018. Being the oldest event, having previous experience running the free/local event and being the only option available for 3 years, they grew very quickly. In 2017, they had 4000 attendees and 4000 lanterns. This comes at a premium. Standard ticket package last year started at 5,500thb to 12,000thb each. All tickets included transportation to/from the city, 1 lantern, and dinner. The VIP tickets included a Krathong to be floated on the river. There was an obvious gap in the number of people that wanted to attend a mass lantern release and the prices that people were willing to pay. So… In 2016, the Yee Peng Doi Saket festival was started with only 500 seats. It grew FAST! Last year(2017), the total number of seats jumped to 1600 seats and 1600 lanterns. This year (2018) they will have 2400 seats and 3000 lanterns (VIP seats will have 2 lanterns each). 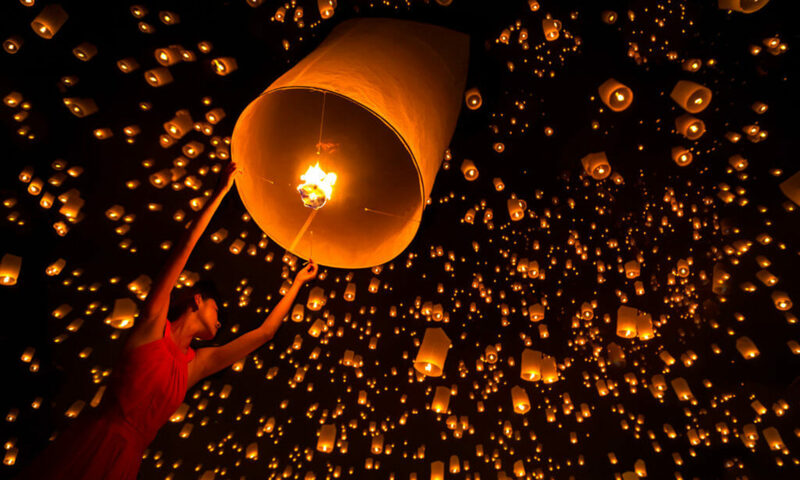 Tickets include transportation to/from the city, a lantern, a Krathong, and a small souvenir. Our initial group of VIP tickets include Front and Center seating(literally right in front of the stage), transportation, 2 lanterns, a premium Krathong, a premium souvenir, dinner, and some basic drinks. There have been a few attempts to create other events, but they seem to have fizzled out due to low attendance (Its not a “mass” lantern release if only a few people are there) If any show promise this year, we will see about arranging tickets and make them available on our website. We are working on creating a general FAQ related to Yee Peng and the lantern festivals. Until its finished, please feel free to ask any questions in the comments below. CMStay no more… Well, kind of. In previous years we have offered Lantern Festival information and tickets under the name CMStay and use the website CMStay.com. While CMStay was the first and original site for everything Yee Peng related, we have found that it is cleaner and easier to create a new website for the Lantern Releases so CMStay Co. Ltd and CMStay.com can focus on the property management business. With that being said….drum roll… Welcome to YeePengLanternFestival.com, the SOURCE for everything related to Yee Peng and the Yee Peng Lantern Festivals! While there is a change in the name of the websites (and business structure) there is no change to the services offered, owner or staff running events. We look forward to continuing our work with the Yee Peng Lantern Festival events and will continue to be the first and foremost authority on Yee Peng Lantern Festival events.